Simply taking the time to consider all the ways in which the world needs healing can be enough to knock one to the ground. The prospect of change is an overwhelming one, and it is an impossible burden for a single person to bear. You can't do it all, not all at once. But you can do it. You can enact change. True, effective, and long-lasting change starts with one person, just one step at a time. In a world trained in mindless consumerism, some of the biggest ways to make a difference are in changing our individual daily habits, to become more aware of how our actions impact others. 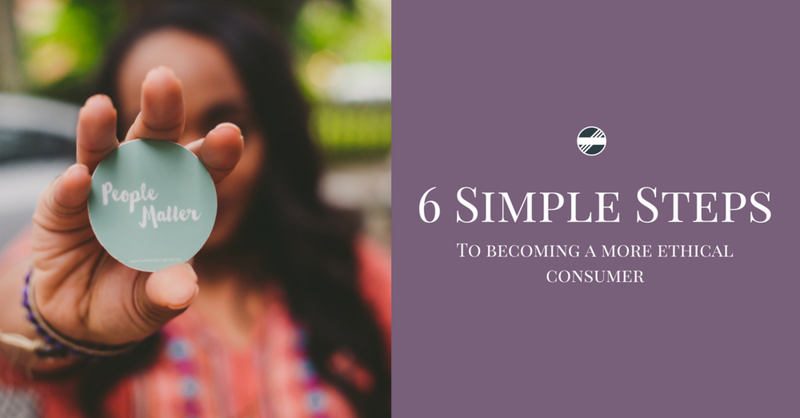 By taking these simple steps to become a more socially conscious consumer, each of us can do our part to create a safer, fairer, more ethical world. And when one person does their part, more than often, another person follows right behind. Who made this and what conditions were they working in? Were those who made this product paid fairly for their labor? Were harmful chemicals used in the production of this product? What impact will it have when I am finished with it? What does this company stand for? What are their positions on issues that are important to me? Remember, like any life change, you can't do it all at once. Take small steps, one purchase at a time. When you need a new shirt, take the time do consciously choose the shirt you need to purchase. When it is time to go grocery shopping, find out if your current store meets the standards you've set, and if not, find one that does. This way, little by little, you can integrate this thought process into your life. In the age of Google, finding information on the companies you shop at has never been easier. In minutes, you should be able to discover how companies source their products and learn about any potential human rights or environmental offenses they may be part of. If the company doesn't provide easily accessible information on their sourcing, that is a red flag. Companies who consciously work to minimize negative impact, or better yet, to have a positive impact will proudly tell you so. However, even when they do, it is often good to look just a little below the surface to ensure that their actions match their claims. So you just found out that your favorite coffee brand enables unsafe working conditions for its laborers. No need to fret! There are many many options out there for coffee or underwear or clothing that are fair trade and ethically sourced. Now is your time to find your perfect match! There is no need to settle for less. Most often, products sourced under fair trade guidelines are higher quality and better for you and the environment. But it may take some trial and error before you find your perfect replacement brand. Local farmers and small businesses rely on their neighbors for success and contribute to the growth of your community. When you shop local, most often you know exactly where your products came from. And if not, it is not difficult to find out. Often, it is easy to forget that companies depend on consumers to succeed. You have more power than you realize. Use it! If you find out that a brand you love is not meeting the standards that are important to you, let them know. And get other people to let them know too!